Airless Tires & Bulletproof For The Army - The Honeycomb Tire! One of the most annoying things that can happen to a driver is getting a flat tire. But for the army, it can be the difference between life and death. 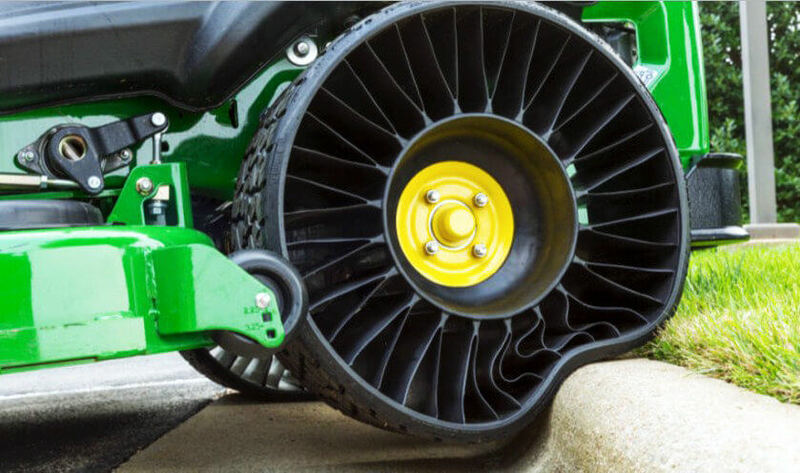 This Airless Tires – ingenious honeycomb design by a Wisconsin engineering company may be the key to a new airless tire that could keep military vehicles running faster and longer after an attack. Resilient is the company behind the distinctive, honeycomb inspired tire design which has become known as the „Honeycomb Tire“, Airless Tires or the „Humvee Tire“. Airless Tires Flatless & Bulletproof Tires For The Army – The Honeycomb Tire! The military wanted an alternative to the current Humvee “run flat” tires, which despite the name, still need a minimal amount of air pressure to roll and can leave troops stranded after being shot or blown out. With this honeycomb tires, that’s all going to change. Aside from strength, the design allows shrapnel and high-caliber bullets to pass through the tire. This is beyond awesome, and i would love to get my hand on these tires. You? Check it out! World’s smallest W18 motor is an engineering art in motion! Sleeper Ford Falcon GT shows Gallardo who is the boss!!! Hydraulic valves – various types and functions explained! Rider And His Kawasaki Z1000 Disguised As Predator Hunters!